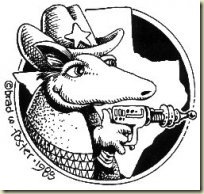 This weekend, I will be participating — along with scads of other Texas speculative fiction writers — in the 32nd annual ArmadilloCon. If it’s like the others I’ve attended, it should be quite the party. This are more than 100 participants at this year’s Armadillocon, including guests Rachel Caine, Cat Conrad, Anne Sowards, Elspeth Bloodgood, Nancy Kress, Ilona Andrews and Michael Bishop. San Antonio will be well represented with myself, Scott Cupp and Joe McKinney in attendance. Of course, the difference between Armadillocon and so many other cons is that the focus is on books rather than movies, TV shows and toys. In other words, there are a ton of creative panels covering all kinds of speculative fiction and (generally) no people walking around in wookie costumes. I will be participating in the panels New Weird: Has the Old Normal Taken Over (5 p.m. on Friday), Trials and Tribulations of the Short Story (noon on Saturday) and Is Lovecraft Hurting Horror (11 a.m. on Sunday). I’ll also be doing a reading at 8:30 p.m. on Friday and 4 p.m. on Saturday and a 1 p.m. autograph session Saturday. The con runs Aug. 27–29 at the Renaissance Hotel Austin, 9721 Arboretum Blvd. A three day membership is $50. Individual daily passes are available for $25 (Friday and Sunday) and $35 (Saturday). Drop on by. If you haven’t been before, it’s quite a show. Even if no one is walking around in a wookie costume. This entry was posted in Uncategorized and tagged anne sowards, armadillocon, cat conrad, elspeth bloodgood, ilona andews, joe mckinney, michael bishop, nancy kress, rachel caine, scott cupp by sanford. Bookmark the permalink. Your reading rocked! And a great time was had by all.